The other day I came across something that reminded me I have a light meter collection. The item in question was a Weston Master III light meter – but in a less common black body with a white dial configuration I hadn’t seen before. Aha, something new to acquire! Then I realized I should share with you the rest of the collection, and my fascination with the darn things. I don’t remember which light meter started off my Weston collection – the only brand I collect. All I know is that 20 years ago, they were common fodder at camera shows, and often came in with older traded-in equipment. Basically, Weston kicked off the whole light meter thing. The first viable electrical light meter with a light-sensitive cell was the Electophot of 1931- but it was bulky and needed a battery to get readings off the selenium cell. It wasn’t a success – which makes it a super rare and valuable collector’s item today. The Model 650 Weston meter had distinctive Art Deco styling. Notice that the Pierce extinction meter sitting below it copies the 650’s style. The Exophot (styled after the Weston Master) and Wirgin are also extinction types. Weston, the same company that made those big dials and meters that adorned the walls and control panels of hydro electric plants in the 1920’s, jumped into the photographic market by making a light meter with two selenium cells and a gauge in the middle: the model Universal 617 of 1932. These too are pretty rare, and I’ve never seen one in person. The last time I saw one up for sale on eBay, the price tag was too rich for my blood. Soon, however, Weston was able to run with just one selenium cell with the model 617 type 2. We did have a nice working one here years ago, but I never put my claim on it, and it went to some other collector. A more common model is the Model 650, with its octagonal bakelite case with 1935 art deco styling. This original Master is the one that got it all going. The secret of the Master series was the flip open door that set up the low light range.The white cap is the “Invercone” incident attachment. But I think the breakthrough meter for Weston was the original “Master” of 1939. The cell was now sensitive enough to have a pinhole cover over it for bright light. Flipping it open changed the meter scale to the low range, and you could make accurate light readings indoors. Gasp! You can’t really discount the importance of such advances like this in the 1940s. 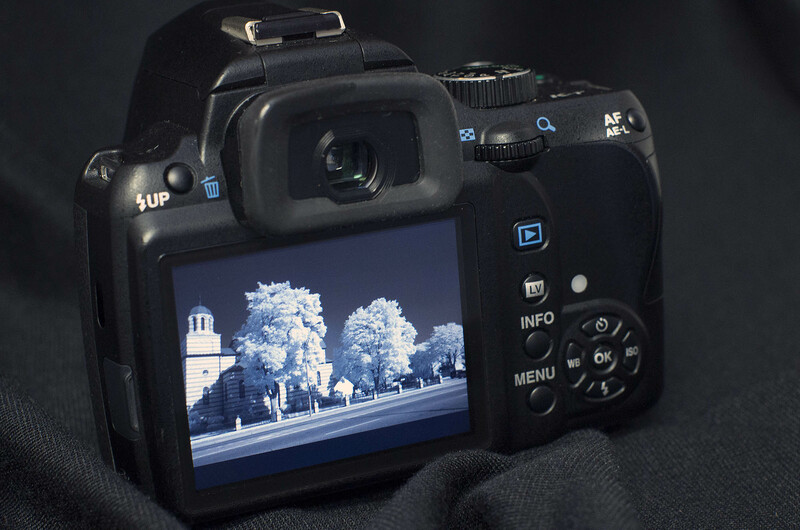 Now the serious photographer could measure the real, actual light available in most settings. Film could be exposed reliably, not wasted. If you could afford a good meter like the Weston, you were king of the photographic world. prone to error. Electric meters were the way to go, if you could afford one. The Master II is the most commonly seen Weston, and was available in several variations, and Cine versions. The main competitor to Weston in those early days was good old General Electric, who also made flashbulbs. There are those who concentrate on GE collections, but I’m partial to the Westons. General Electric also made excellent meters, but went on to make your fridge, and then jet engines. 1946 brought the Master II: a trimmed down version of the original, but in a tough metal case. Gaskets kept out moisture and dust. I’m always impressed how well-made these things are. The very similar Master III updated the cosmetics a bit, and looked a bit more 1950s appropriate. The Master III is probably the sleekest version of the series. I wasn’t aware there were any made in black, until I came across this English-made one just a few days ago. The Master IV of 1960 or so, was further trimmed down, now in a stainless case, and a switch to lock the needle’s reading. It was also the first to go with proper ASA (now ISO) film speed settings. The earlier versions used “Weston” speed, which was only 1/3 stop off from ASA. The IV also had a much cleaner, easier to read dial – so you’d be forgiven for thinking the V of the 1970s actually looked older as it reverted to the tiny, hard to read, markings of the earlier meters. The Master IV (English on left, Japanese on right) went with a smaller stainless case. Neater, but not quite as rugged. Each generation seems to have benefited from more sensitive selenium cells, and I’ve found you can’t really interchange the cells between models. Oddly enough it’s common to come across an ancient Master II that works perfectly, but a IV or V will have a dead meter cell. I can only conclude that the older style varnish or coating put over the cell to stop it oxidizing and dying was longer lasting. The newer cells often get spider web cracks on them and no longer make voltage. About 15 years ago I got ambitious about rescuing the old Master IV and V by replacing the selenium cells with silicon cells you could buy at Radio Shack. Yes, they put out more voltage, but I reasoned that with the right neutral density filter over top, I could dial them in. Well, they worked; sort of. With some tweaking I could get excellent accuracy in daylight, but indoors under tungsten light they would over-read by about 1.5 stops. I traced this to the stronger sensitivity of the silicon solar cell to infrared – which regular light bulbs pump out in abundance.Still, for outdoor work, they were fine. I marked these conversions with a little “si” on the dial, and used them often.But back to the collector’s items. There are quite a few variants of the Weston meters, even if you’ve got Masters I to V collected. For instance, the case and dial colours do vary, especially if comparing those made in the USA to those made in Great Britain (sometimes marked “England”). I don’t believe I’ve found a Master IV or V from the USA, but I recently found a IV marked “Japan”, which I didn’t know existed.My collection also has a Master 6, which I bought on an early eBay auction. I paid way, way too much, only to discover the 6 is not a true Weston, as it is lightweight plastic. Oh, and didn’t work either. The Master V was the last true Weston master. The Master 6 looks pretty, but it’s actually lightweight plastic. The last true meter in the Master line was the “Euromaster” which was apparently made in England after Weston lost interest in the photo market. Pretty much identical to the V, it soldiered on for some years, bought by photographers who still wanted a no-battery, reliable meter. There were other Westons over the years, including many less-costly models. But the only ones to challenge the Masters were the Rangers – a line of battery CDS celled models. I have admired them, but never bought one. It appeared Weston was out of the photo market by the time silicon cells and digital readouts became the norm. Well, no, I suppose the “norm” by then was the in-camera meter, already hooked up to electronic controls of shutter speeds and/or apertures. Those who did need a hand-held meter began to prefer something like the Gossen Lunasix with its near-darkness abilities and narrower measuring angle – even if it did need a battery. The sun had set on the Master series. Still, I love to pull out the Westons from time to time, admire their build quality, look over the artwork of the instruction manuals, and think back to a time when a solar cell and a meter movement was honest-to-goodness state of the art. It’s also nice when testing out a vintage camera to bring along the appropriate era Weston – say, a Master III when trying out a Leica M3, for instance. I know, I really should seek help. I thought I was done with lens testing for awhile, after that round of comparisons of four generations of 300mm Nikon optics. At least I thought the results were interesting. I think I can still hear you yawning. If you recall (or scroll down to my earlier post) the results of the two different teleconverters I tested were interesting too. I had thought my ancient TC-200 converter was a perfectly good optic – until I put it up against the TC-301 that was supposed to be a better match for a 300mm lens. It’s no fun finding out that your earlier notions were all wrong. Then just the other day, a third gizmo arrived on the scene, threatening the superiority of the TC-301. This is Nikon’s mighty TC-20E III, that not only boasts a hefty price, but also “aspherical” optics. How good would this be? Well, if you can put something to the test, you must. And so out came the lens, test chart, and the two older converters. But let’s have a short discussion about teleconverters first. 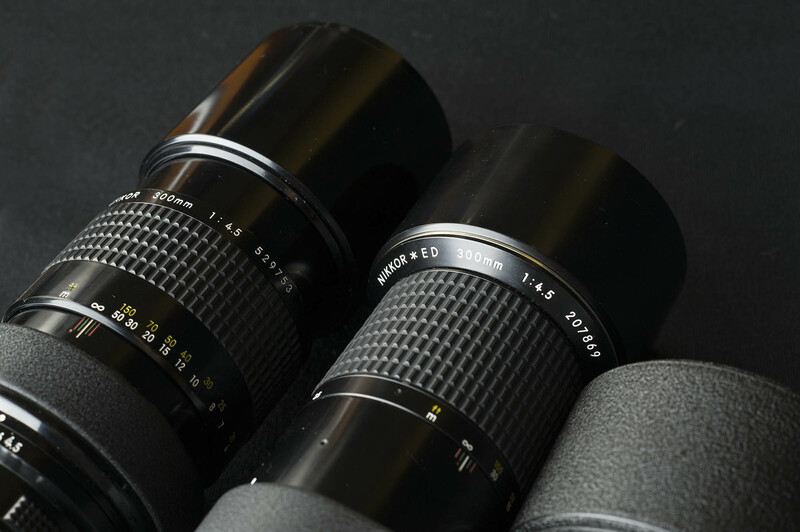 Many of us recall when they were sold inexpensively as add-ons to our basic telephoto or zoom lenses. It was an easy up-sell to convince someone that the $229 aftermarket zoom lens they were buying (probably an 80-200mm, if this is 1980 or so) could be quickly transformed into a 160-400mm with an extra $50 gadget. Sold! Trouble is, those converters got used once or twice, then got pushed to the back of the drawer after the results were, shall we say, a little disappointing? Stretching the limitations of a budget lens with a budget add-on wasn’t a recipe for sharpness. Often the exposure came out a little dark too. The teleconverter add-on. Some were good. Most were bad. I have what amounts to a scrap heap of these old converters from the manual focus era. Take your pick of lens mounts; I think I have them all. So what happened to inexpensive add-on teleconverters? Where’d they all go? I think a few things conspired to make the budget converter a thing of the past. The first was autofocus. 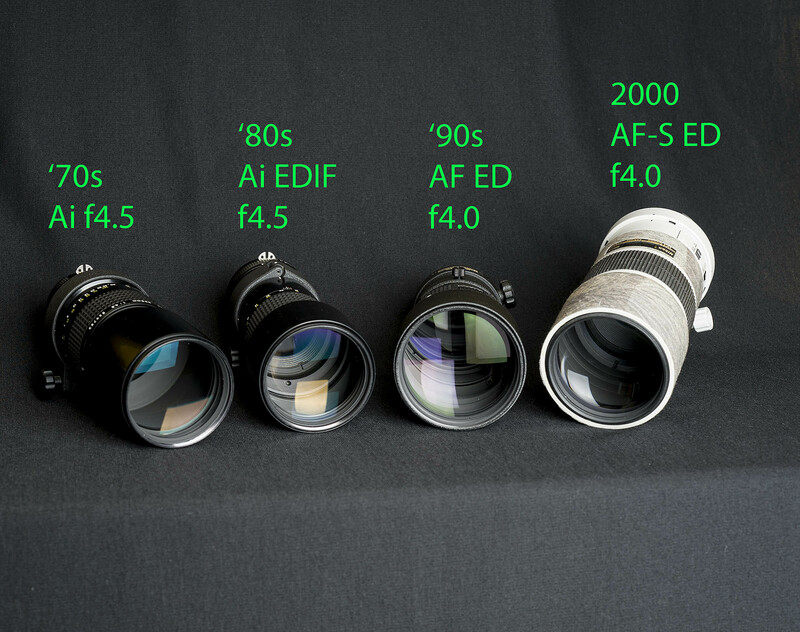 Since AF cameras worked with lenses as slow as f5.6, f5.6 became the standard for the inexpensive (or not-so-inexpensive) zoom lens. Putting a 2x teleconverter on such a lens drops its effective aperture down to f11 – where autofocus often hunts and searches, if it tries at all. Converters intended for autofocus also have to have extra couplings and/or electronic contacts, which makes them more costly than their 1980-spec predecessors. And then, of course, inexpensive zoom lenses got stretched to the 300mm range, at which point most people are quite happy and realize they can’t make good use of more magnification, especially with a crop-sensor DSLR. But don’t professionals use teleconverters, I am often asked? Yes, yes they do. But putting a $400 or so converter onto a $3,000 or more lens isn’t quite the same thing. When a lens is big, heavy, and made with premium optics, then adding a little gadget to the bag that can boost its range by 40%, 70%, or 100% can be worthwhile, even if it costs you a little sharpness. This is where these three Nikon converters come in. All were/are pro-grade for their respective eras. Up for testing: three top-notch teleconverters and a lens that is no slouch in the optical department. The TC-200 (which was later made as a TC-201 with updated Ai-S couplings) is my old standard. As an old 2x manual converter, it means you have to put up with manual focusing on any newer AF lenses. G-type lenses without an aperture ring won’t work. But on the plus side, it was intended to work with and fit a wide variety of Nikon lenses, as its front element is nicely recessed. It has seven elements, which is a badge of a top-grade converter. Many companies, like Vivitar made both high-grade 7-element, and budget 4-element versions. Cheap converters were all 4-element, if you were lucky. The TC-301 is an odd duck. 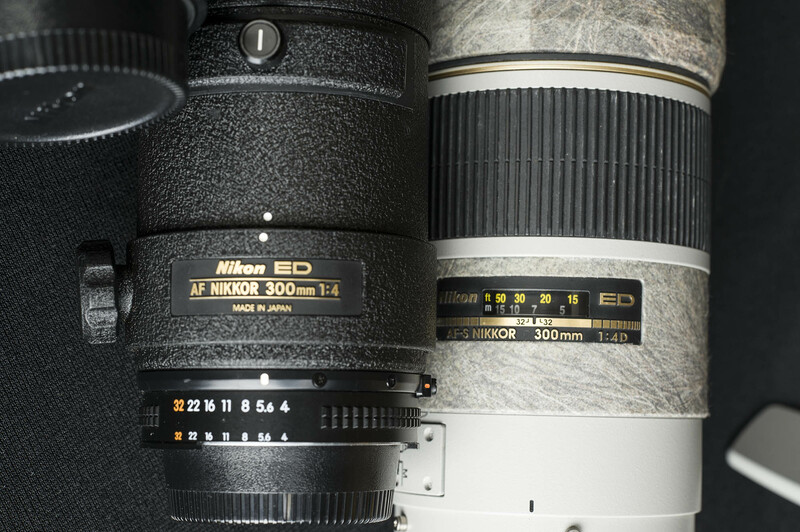 No it’s not a 3x converter (Nikon never made one); it’s still 2x, but its name implied it was made for lenses 300mm and up. That big snout of a front element only fits lenses that will allow it inside. It has only five elements, but they’re obviously widely spaced out in a design optimized for big glass. The newest one is the TC-20E III, and has one aspherical optic in its 7-element design. It’s noticeably heavy. The big thing, of course, is that it supports autofocus, and G-type lenses. The down side is the list of lenses it fits is quite small. A tab on the front mount physically blocks from fitting unapproved lenses, although some owners have resorted to modifying the mount to fit a few more. The three different designs up for review. All are pro-grade, and not to be confused with the cheap add-ons of yesteryear. One of the least costly lenses on the approved list is the 300mm f4.0 AF-S I happen to own, so that’s what I used for testing this time round. One lens allows us to learn something, even if we can’t learn everything. So, the lens was mounted on my big tripod, converter and camera on the back. Focusing was done carefully on magnified live view, and the flash exposure was made with the mirror locked up. Hopefully this gets rid of any notions of camera shake ruining the data. Again, the results were interesting. And again, the TC-301 came out on top. Unless there’s something wrong with the new aspherical converter, and I doubt there is, the old design showed it up – except perhaps with the lens used wide open (effective F8) where the TC-20E III is a tad sharper. 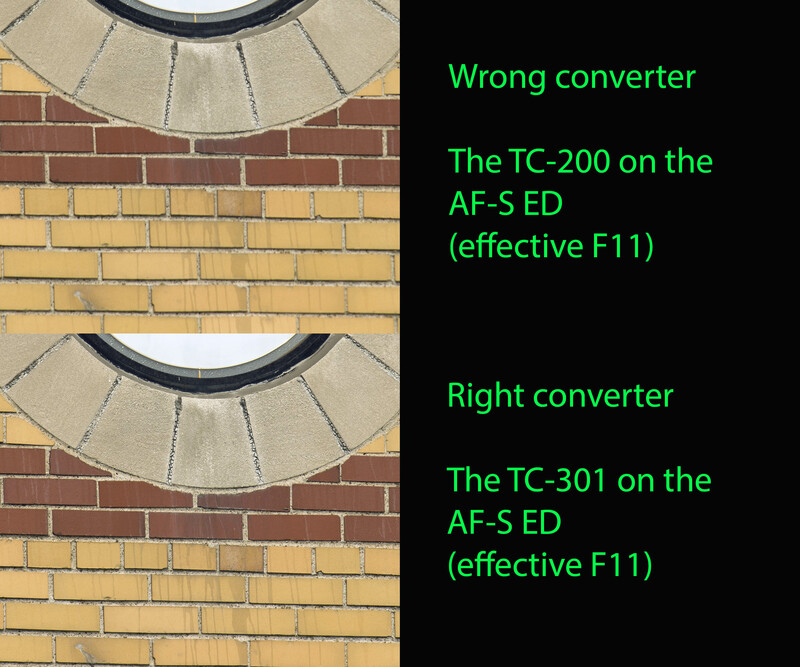 But again, the TC-301 was best in the corners, and added less chromatic aberration to the image. The TC-200 again proved it is not up to the standard set by its big brothers. However, it was intended to be a doubler for lenses shorter than 300mm. I didn’t bother testing how easy it would be to remove the chromatic aberrations in Lightroom or Photoshop, but rest assured, that might be helpful. As you can hopefully see from the composited test shots, all three converters benefited mightily from stopping the lens down to an effective f11. Again, I didn’t bother stopping down further because I don’t think the world needs a 600mm f16 telephoto, sharp or not; f11 is dark enough. The odd-looking, and obsolete TC-301 delivered the best overall results, especially at f11 (one stop down). Note less chromatic aberration. So does this mean we can write off Nikon’s latest top-dog teleconverter as not living up to its obsolete predecessor? Probably not. 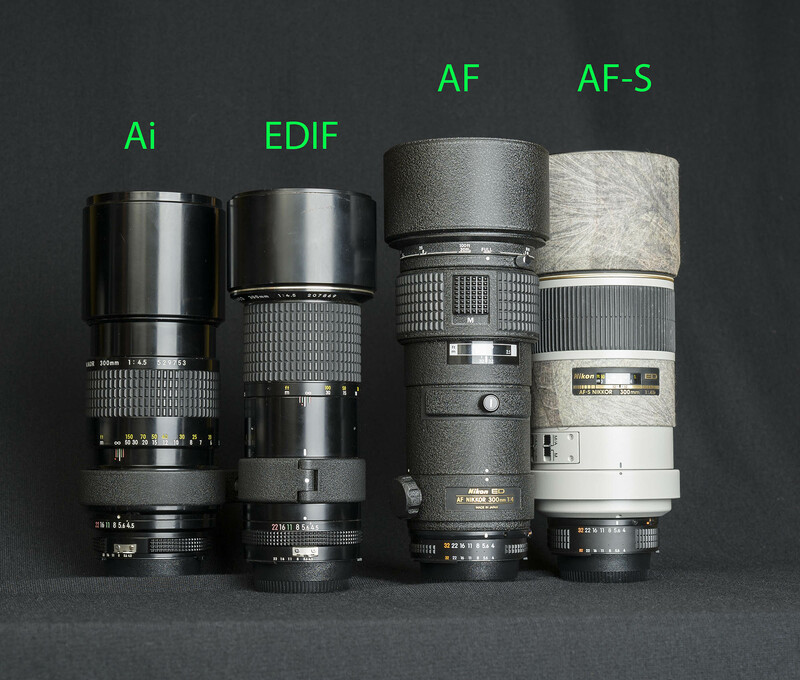 Obviously the new unit allows AF with its approved list of lenses, but we have to concede that testing just one AF-S 300mm lens might not tell the whole story. This TC-20E III was built mainly to double the range of some really big, and really pricey optics. 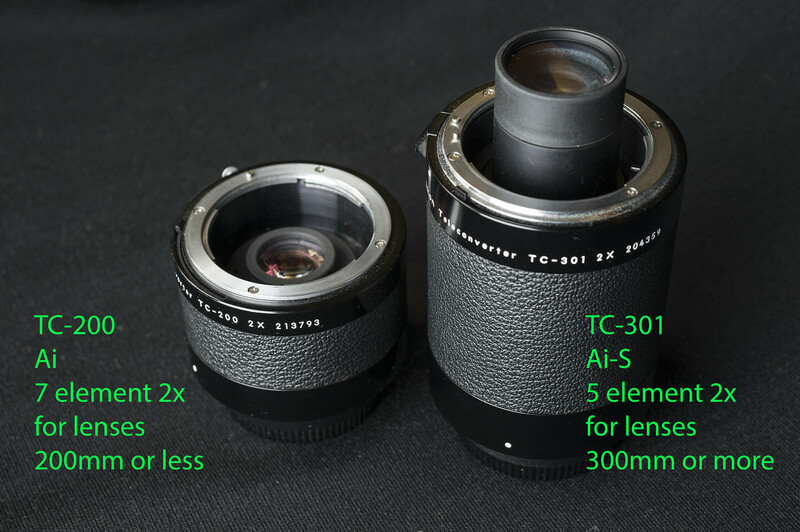 How well does it perform on a 400mm f2.8, or a 600mm f4, compared to the TC-301? I can’t say. And if and when the stars align enough to allow me to play with one of those behemoth optics, I probably won’t have the suitable converters around to run more tests. The TC-20E III had the best centre sharpness with the lens used wide open. At the end of the day, am I ready to retire my venerable TC-200, given that it came up dead last again? Well, no. Don’t forget it was actually designed for shorter lenses than the 300mm. However, while it fits, it isn’t recommended for my 80-200mm f2.8 either (I do recall some noticeable light falloff last time I tried it). No doubt there’s a lens or two in my collection where the TC-200 will shine. I’ll just have to get out the test chart again to find out for sure. This time, I promise not to bore you with the results. The other day, I had not one, but two early versions of Canon’s F-1 film SLR on hand. One had come in for cleaning and service. The other I had purchased. But both were in spectacularly excellent condition, given their age. Photographers these days take it for granted that Canon makes a wide range of camera equipment, from basic up to pro level. But it wasn’t always so. Apparently, in the 1950s, as the 35mm format really took hold – mainly with the success of the Leica M3 and M2 – it was recognized that what was needed was a pro-grade 35mm SLR. The rangefinders were wonderful things, but were miserable to use with lenses over 90mm. There were SLR adapters for the rangefinders, such as Leica’s Visoflex, but it seemed the writing was on the wall to make the 35mm SLR turn pro. Exakta brought out the first proper 35mm SLR back in the ‘30s, and by the ‘50s the Exakta had company from Pentacon, Asahiflex, and others – but none were rugged enough, elegant enough, or had bright enough viewfinders to go up against the rangefinder. At least not until 1959 when Nikon introduced a truly pro-grade SLR. It took a beating (as many photojournalists delighted in proving), it was bright and easy to focus, and it took a motorized drive. Nikon really had the 1960s to themselves, it seems. There were a few contenders from such as Topcon, Pentax, and even Leica – but basically, if it was 1967 and you shot 35mm professionally, you wanted a Nikon F.
Canon had soldiered on during this time with their very nice rangefinder 35mm’s. Sure, they had a few SLRs, but they never pretended they were pro-grade. But if you look at the steady improvement in Canon’s SLRs through the ’60’s, it was apparent something big was coming. And in 1971, Canon dropped their bomb on the photo world. The F-1 was big, shiny black, very cleverly designed, and obviously tough. The F-1 has a look that commands respect, even today. Launched in the early 1970s, Canon’s F-1 certainly looked more refined and modern than its SLR predecessors. Canon definitely stuck it to Nikon in several ways – at least compared to the original F. The F-1’s finders slid in on well machined grooves. With the Nikon you had to mash them down and listen for a “click”, that sometimes never came. The Canon took a motor drive or winder, right out of the box. It didn’t have to be sent in to Nikon to get fitted and calibrated. And it had accessories. Tons of them. For quite some time, Canon’s advertisement campaign for the new camera was a black and white ad that ran on the back of most photo magazines. It showed a sea of lenses, finders, focusing screens, backs, motor drives, and more. And almost hidden in the middle was the F-1 body itself. The message was clear, the F-1, like Canon, had fully arrived. There’s a lot to admire on the original F-1. I love how the meter cell is positioned at the back edge of the focusing screen, siphoning off some light from the partial area metering rectangular patch you can see in the finder. It meant you had to use a new-fangled circular polarizer, but so did the Leica R3. Oh, and those focus screens have machined frames that perfectly snap into the body. So nice. On a Nikon you sort of push the release button and watch them rattle into place. If one doubted the pro credentials, there’s always a titanium foil shutter to back you up. The prisms and focus screens were top-shelf to be sure. The meter was part of the camera (see that meter cell?). The only weak link proved to be the lens mount. Funny thing is, the F-1 didn’t really take over the photo world at that time. It would take longer for Canon to truly take their position alongside Nikon at the top of the 35mm SLR heap. Why was that? There’s no denying the allure of the F-1 body. It was definitely durable and tough. I’ve seen a few well worn examples over the years, but I’ve seen a lot more looking like the one in my photos here. It lived a pampered life in the soft-lined gadget bag of an amateur enthusiast. It didn’t get tossed around in a pro’s photo studio, and certainly didn’t get clattered around against other equipment in a press scrum. Of course, Nikon had more than a decade’s head start over Canon in the pro SLR world, and many news rooms and photo studios already had a stock of Nikon lenses to put on the new F2 Nikon brought out around the same time. That was one obstacle. It didn’t help either that just around the same time Olympus took a shot at the pro market with their OM-1 – and tried to convince journalists and the like that smaller cameras, not bigger, were the way forward. But the biggest hurdle Canon had was the lens mount on the F-1. Newly updated, the FD lenses had all kinds of linkages and tabs that Nikon would take years to catch up with, but there was no denying Canon got their mount from those earlier lightweight SLRs. The breech-lock “R” mount was updated for open aperture metering with the “FL” mount, then came the “FD”. All shared that wonderful wear-resistant breech lock – but spend a few days with one, and you’ll realize that it was more fiddly to change lenses than with a traditional bayonet mount. You could get it wrong, especially in a dimly-lit room. And then there was just the fact that the camera end of the mount was decidedly thin and wispy compared to the Leica R mount, or Nikon’s F mount. It worked fine for smaller lenses, but big long, heavy telephotos could work the mount loose on the body. Also, at that time, Canon were ahead of the curve by using more plastic parts in their lens barrels. We’re used to it now, but at the time, professionals expected all their lenses to be all-aluminum barrelled, with maybe a rubber focus grip. Well, and there’s that motor drive. The F-1 could accept either a nicely sculpted motorized “winder”, or a full-tilt beastly “motor drive”. To compete with the Nikon, you needed the big one, and my, it was big. The large grip actually stood off from the right side of the camera, and you held the grip, not the camera at all. Together, the rig weighed a ton, and took up several compartments of room in a camera bag. When I come across them, most look like they were never used at all. No surprise there. Jokes about boat anchors abound when old guys talk about that old Canon motor drive. Fighting over the same pro market in the early ’70s, the Canon F-1 dwarfed the smaller, lighter Olympus OM-1. Of course Olympus is trying the same again today, with their digital mirrorless bodies. Canon wouldn’t make that mistake again, though. When they brought out the totally redesigned F-1 (dubbed “New F-1) ten years later in ’81, it had a smaller neater motor drive. Trying to listen to the whining of professional customers, Canon kept the new camera as a full-manual match needle SLR. But adding a winder or motor gained you shutter priority automation. 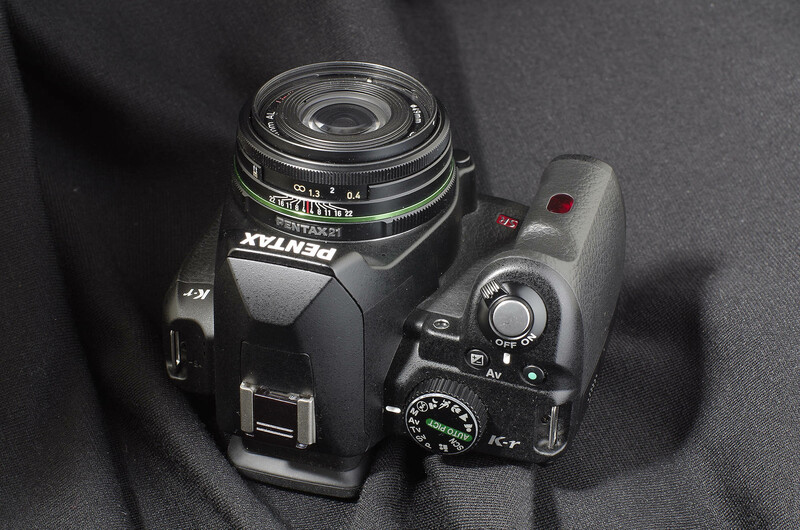 Swapping out the prism could get you aperture priority auto as well. By fiddling with focusing screen choice, you could have partial area metering, averaging, or spot metering. Needless to say there were tons of focus screens in Canon’s catalogue, with three versions for each style. But we can’t forget that only a few years later, Canon brought along the T90, that could switch meter patterns and exposure modes with the push of a button. It also had what Canon oddly left off the New F-1 – TTL flash exposure. Oh, and the T90 only needed four AA batteries to run it all. Still, the T90 and the New F-1 continued with the shortcomings of the FD mount, and as a result never quite reached the top tier of pro acceptance. With the coming of autofocus, Canon knew the gig was up on the FD mount, and went back to the drawing board, much to the gnashing of teeth from all those well-heeled amateurs who had invested heavily in some very nice FD lenses. The new autofocus-capable EF mount was not compatible with FD cameras or lenses, but it was the way forward. And with just a couple of generations of pro-grade EOS camera bodies, Canon had achieved widespread acceptance among working pros. I had plans to find some other nice FD lenses to go along with the pretty FD 50mm 1.4 SSC this F-1 came with. Well, I had plans, but a young fellow spotted it on my shelf and promised me he needed it more than I did. I had to agree, and so parted with it. Maybe I’ll find a way to hang on to the next one longer. As promised, I took the plunge and bought a digital SLR camera, with the express purpose of converting it to infrared-only photography. I settled on a Pentax K-r, mainly because the price was right, and I realized that my Nikon lenses were better suited to full-frame photography and I didn’t have the budget to go cannibalizing one of those. My widest lens in the Nikon system is my 20mm, which isn’t all that wide on a 1.5x APS-C format body – and for some weird reason it’s not all that sharp on those bodies. For the Pentax crop format, I’ve got the sharp 21mm. Just about as wide, and maybe I need an excuse to buy something wider anyway. Another bonus to using the K-r is it does have live view for more precise focusing of the infrared image, in case I can’t trust the focusing screen or AF. There’s also in-body stabilization – something we never dreamed of in Kodak infrared days gone by. 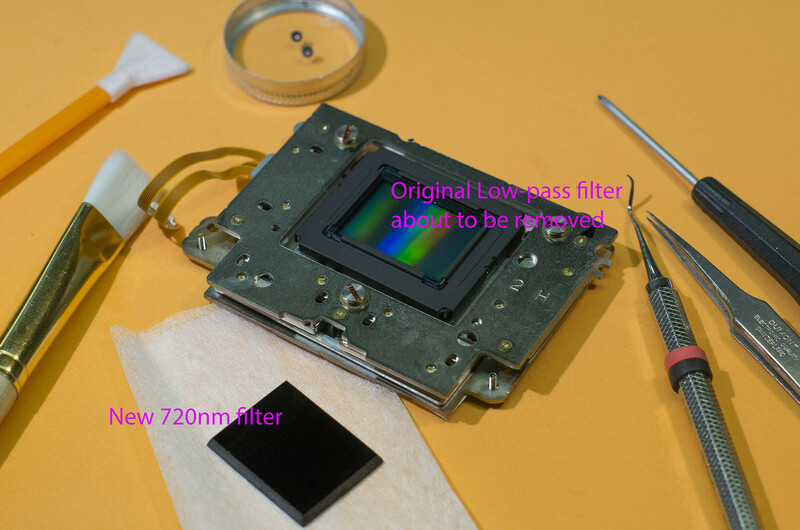 For the conversion filter, I decided on cutting down a spare Hoya R72 (720 nanometer) filter I already had on hand. There’s always the possibility I might go to the more colourful 665nm type at a later date. Converting the Pentax is definitely more of a challenge than what I’ve tried before, as Pentax for some reason uses more soldered connections to its main circuit board than is typical. It’s not a problem doing it once, but since I ended up adjusting the focus three times, it got to be a bit of a chore. After first installing the filter, I moved the sensor backwards on its spring-tensioned adjusters a precise amount, hoping to get in the ballpark for focus accuracy with AF and the finder. This is necessary because the combination of longer wavelength light and the thicker filter require the sensor to be slightly behind its stock position. Sure enough, I fell short and needed to move it back further. In fact, it was way out – focusing on a target 2m away showed decent sharpness at about 4m. Whoa. I tried to get clever and carefully calculated the exact adjustment required and dialed it in on the second try. Nope, for some reason I was closer, but still short. On the third disassembly and reassembly I found I had perfect focus for my 21mm lens. The 40mm works well too. The next challenge to converted infrared is colour. If all you want is black and white imagery with near black skies and white trees, you can simply switch the camera to B&W and have at it. With normal white balances you’re dealing with a red-and-white image. But part of the fun of converted cameras is the delicate colours you can achieve by isolating the subtle tones between the sky and foliage. The trick is to get the right white balance. But since you’re essentially shooting through a near-black deep, deep red filter, that balance is way weirder and well outside the usual daylight-to-tungsten spectrum. A custom pre-set balance is the easiest way to go, when you take a reading off green grass in sunlight. Unfortunately, the Nikons I converted refuse to read that far down the colour spectrum. But the K-r obliged and loading the raw files into Photoshop showed a colour temperature of 2000k, and a “tint” of -90. At this point, the sky looks deep sepia brown, and the trees light grey. I also found that raising the tint to around -75 puts a bit more colour in the foliage, if you want it. Then you do a “channel swap” – I use Photoshop’s channel mixer for this to make the red channel 0% red and 100% blue, and the blue channel 100% red and 0% blue. I save it as an “action” to speed things up with multiple files. Now you’ve hopefully got a deep blue sky and ghostly trees. Monkeying with hue and saturation can also get you closer to your heart’s desire. Now I can go snap happy in the world of infrared, just in time to see the leaves fall off the trees this season. Without foliage, infrared doesn’t have as much to say. I’ve still got time. Maybe this was the way infrared was meant to be done. No temperamental films or filters. I don’t even need a tripod as the camera’s effective ISO is just about the same as visible light, maybe even a tad more sensitive. And the images are much, much sharper than I’ve ever managed with any other IR material. So my old apologies for softness or grain are gone (“well, I shot it in infrared, so that’s what you get”). Where was this 20 years ago? Since I’ve still got more than half a Hoya R72 filter left, and maybe you’ve got an older DSLR that could use a new lease on life … well, let’s talk. It took some practice to get the best from these films. The Ilford is still available. This is what colour infrared film gave you. Weird and wonderful, for sure. You can get close with post processing, but there’s no substitute for the real deal. The long exposures on a regular digital body (here, the K-01) hurts sharpness a bit. I can’t think of an article I’ve drafted, re-written, and re-drafted as many times as this one. I’ve gone back and forth on the subject so many times, but I think I’m finally coming to terms with it. To start with, there are at least two areas of photography in which I am well equipped to tackle – even though I seldom do. Strangely enough, I have enough macro equipment to make one think I am an accomplished close up photographer. Yes, I’ve got a nice macro lens, adapters to put enlarging lenses on bellows, extension tubes, high-grade close-up lenses, a focusing rail, reverse adapter, and other assorted paraphernalia. I guess I just like playing with the gadgets, because I don’t really do all that many macro photos. Then there’s infrared. I have experimented long and hard with invisible light photography. I have tried different films, filters, and cameras. And yet, aside from a handful of nice images, there’s not all that much to show for my efforts. Now I wonder if it was all in vain anyway. 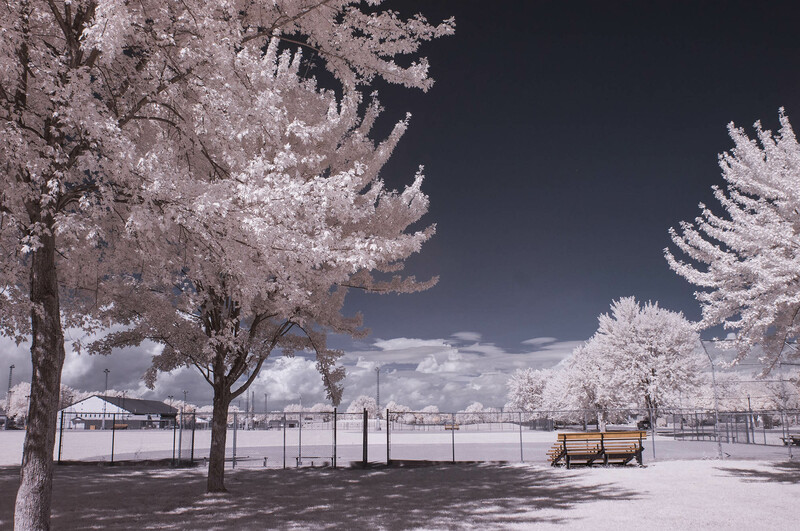 Is infrared photography irrelevant nowadays, despite our best efforts? In the beginning, there was Kodak’s High Speed Infrared film. I don’t think we appreciated it as much as we should have, back then, when it was just about the only game in town. By the 1980s, it was only available in 35mm, and it was oh so grainy. And strongly-lit highlights “glowed” bright white – something its fans loved. The amazing thing about it, was that it delivered the goods with the use of just an ordinary R25 red filter. Kodak’s clever trick was to make this film see deep into the infrared light spectrum, but made it almost blind to red light. All you had to do was stick the red filter on your lens to wipe out all wavelengths from violet to orange. You could then focus and compose through the red image the film couldn’t see, and then happily photograph those wavelengths in the infrared 700 to 900 nanometer range – where the black and white world takes on a ghostly tonal scale: deep black skies and bodies of water, luminous foliage and skin tones – but all with a soot-and-whitewash high-contrast effect. And you could shoot it handheld at reasonable shutter speeds. Nice. Sure, you had to learn to load your 35mm camera in complete darkness, but otherwise, Kodak’s High Speed Infrared was downright convenient compared to the other films that came later. On the downside, I found exposure was downright unpredictable – I ended up with many films with thin unprintable negs, and others blown out so dense they were also useless. I later tried Ilford’s SFX film when it first came out, and discovered that a red filter left it looking a bit too much like ordinary black and white film. A little more research showed I should have been using an R72 “black” filter to get the proper results. So with an SLR you need a tripod to compose the image first, and then put the filter on to shoot – and since the effective ISO is around 6, you need that tripod anyway. The same applied to the Maco IR720 and IR820, and Rollei Infrared films that came later. And I found you did get a strong, contrasty effect, with black skies and bright trees, but without the “glow” of the Kodak stuff – which is gone a few years now. Ilford’s SFX is still alive and well, and I used some to good effect a couple of summers ago in the Hasselblad. Then there was Kodak’s colour infrared film – Ektachrome Infrared (EIR), which also required loading and handling the film cartridge in complete darkness. Again, this film was really intended for the scientific/military community, but with a deep yellow filter it delivered strong blue skies with magenta foliage. Red things appeared yellow. People looked ghostly. It would have been a lot more fun if it wasn’t so shockingly expensive to use. Once the science guys were all using infrared sensing video and digital cameras, EIR disappeared. So that brings us to digital. It doesn’t seem all that long ago when guys with D70’s and 20D’s were revelling in the delights of shooting infrared. All you needed was that R72 “black” filter and a tripod. In bright sunlight, I recall exposures of around a quarter second. A bit of work in Photoshop, and you had an honest-to-goodness black and white infrared photograph. In fact, excessive infrared sensitivity was a real problem with early DSLRs. I have a Kodak DCS420 (your basic 1.5 megapixel $13,000 camera – fortunately I didn’t buy it new) that I discovered would bleed magenta over the occasional photo – a strong IR-cut filter seemed to solve the problem. I can’t even use that camera anymore, because I don’t have any way to read the removable hard drive. A few years ago, heading up north to cottage country, I decided to bring along my “black” filters, to go with a D200 in the bag, to see how the lakes and trees would look in infrared. I just about gave up. With the ISO hoisted to 800, I still needed a ten second exposure in bright sunlight. The long exposures were noisy, and clouds drifted in the sky and branches waved blurry in the wind. I could only conclude that the newer wave of cameras was less sensitive to IR than their predecessors. Some months ago, I decided to prove this theory – since I had four cameras handy. I used the R72 filter, 400 ISO, F8, and a 1.3 second exposure on an overcast day – which is what a D700 needed to come up with a decent exposure. But the D200 was several stops too dark (aha!). A Pentax K-x seemed to agree with the D700, and an old Canon G2 seemed about a stop brighter overall. So, your mileage does vary, after all. But that brings us back to the title of this posting. Is genuine infrared photography dead and pointless? Why bother with the tripods, black filters and long grainy exposures, if you can just fake it? 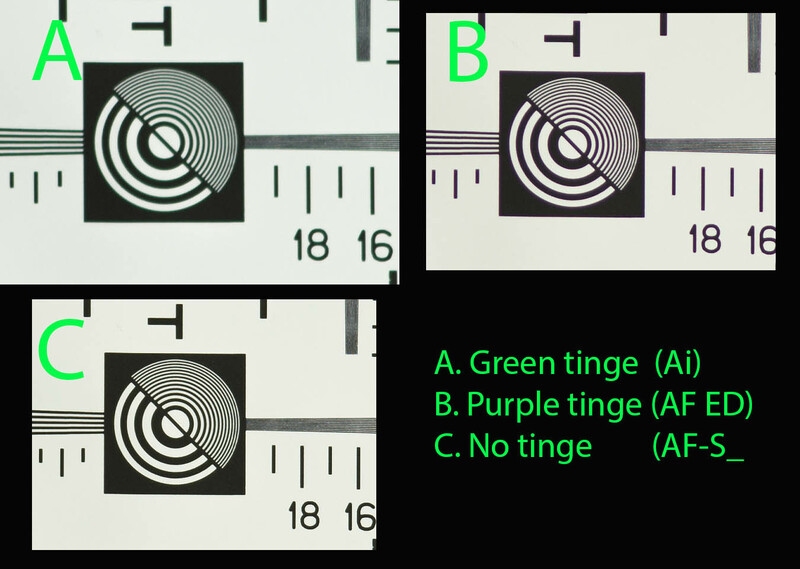 While we use filters and/or special film to record light wavelengths our eyes cannot see, we do have to translate what the film or sensor sees into tones, shades or colours that we can see. So, it’s not really an infrared image in the end, is it? If all we truly want are white trees, black skies, and high contrast – then why not just process a digital file to get that result? I gave it a try with several images, trying to make a passable “infrared looking” black and white, or colour image. I got close. If people think it was shot in IR, then so much the better. I’ve found it doesn’t take too much “photoshopping” on regular colour landscapes to shift blue skies to teal, and yellow or green foliage to magenta to get a “faux infrared” look. “Wait…that’s fake”, you say. And I agree. A real, honest to goodness infrared image has a beauty and grace that can’t be faked by colourizing a regular digital image. 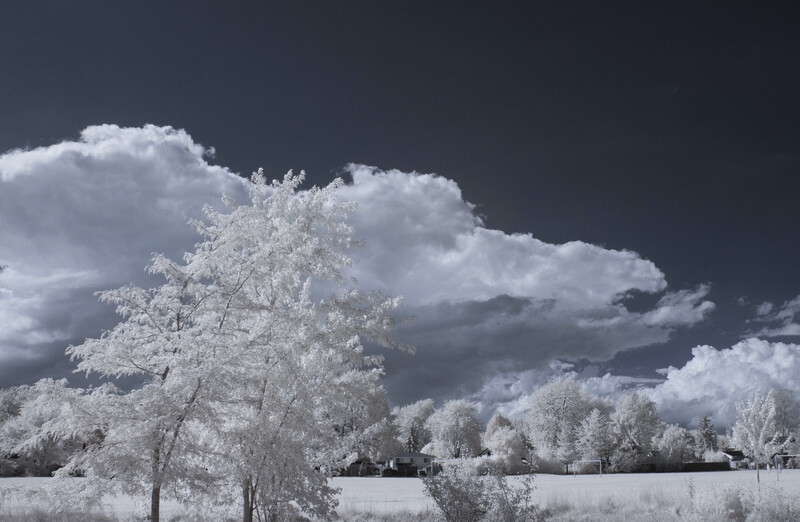 Infrared, after all, is actually a colour the human eye can’t see. If we could add infrared to our vision palette, we probably wouldn’t think of trees as being green. They are so much brighter and vivid in the infrared world. I think the reason infrared landscape photography has staying power isn’t just because it’s a neat “party trick” effect. Infrared makes summer look like it feels, in the same way a polarizing filter makes blue skies look like we think they should. But most of the films are gone, and putting R72 filters over our digital camera lenses results in slow exposures, even in bright light. So that brings us to the converted cameras. I’ve converted a few now for customers, buying the appropriate filter to replace the “hot mirror” glass that normally covers the digital sensor. All have been 720 nanometer conversions (the familiar R72). But you can get weaker cutting filter to leak a bit more colour through to the image, and allow more colourful infrared images – assuming you don’t want to go straight to black and white. Stronger 850nm filters are for the purists who don’t care for colour infrared and want the most potent black and white effect. Another bonus is that by removing the infrared-blocking filter there are no longer two filters trying to block each other out, so sensitivity is close to the original ISO, sometimes even higher. With no filter over the lens, you can focus easily and even hand-hold the camera. 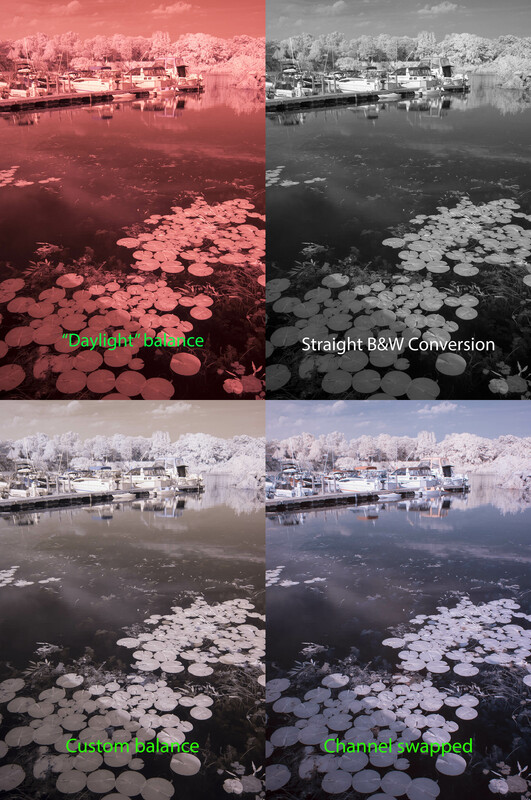 With more and more photographers finding themselves with a perfectly good 8, 10 or 12 megapixel camera sitting idly on a shelf, the infrared conversion option is looking attractive. And I have to confess it’s looking attractive to me too. So after all, infrared is not dead, and I’m on the hunt for a digital body to convert. I’ll keep you posted. This looks cool, but it doesn’t doesn’t cover the frame, and it’s not all that sharp. Sigh! The 50mm Auto 110 lens, if focused carefully, does perform. Somewhere in all that, there’s a camera. You may recall Pentax once boasted a compact camera that fit inside an Altoids tin. The Q isn’t quite that small. Took this June 21. With 600mm of optics, this is what you can get with a Q. The front mounted quick effects dial encourages creative grab shots. Processed in camera from raw. Also processed from raw using the camera menus. The old Auto 110 24mm lens has potential. The Q is small – the old Auto 110 was smaller! I’ve got a proper adapter coming. When I was first shown the Pentax Q, I think I understood it pretty well. It was a palm-sized gem, a jewel designed to maximize the potential of a compact-camera’s sensor with tiny, but precise interchangeable lenses. Of course we are continually reminded of the Pentax Auto 110 of the 1970s – an effort to maximize the 110 film camera with high grade optics – but unfortunately hampered by the lack of precision of the plastic 110 film cartridge. Clearly, I saw the Q targeted at the Japanese urban professional, who spends long hours away from the apartment while commuting, at work, and out with friends. If they want to be a hobby photographer on weekdays with more than just a cellphone, then a quality camera, with lenses, should ideally fit in the shoulder bag along with their laptop. Hence, the Q. But in North America, we are seldom far from our vehicles, where the empty back seats easily swallow our DSLR camera bags. It’s hard for us to see the Q as a practical camera. It’s next to useless at the kids’ soccer games (like most mirrorless models), and the small sensor gives up a lot in ISO performance and dynamic range. In a Tokyo cafe, however, out with friends, the Q is a conversation starter. While everyone else poses with phones, this little camera comes out, its tiny lens is exchanged, and its little flash pops up. What’s not to love? And the fact that it was quite expensive didn’t hurt either. So I could see that the original Q would have a long search for customers outside of big metropolitan areas. That was four years ago now, and a lot of water has gone under the Q’s bridge. The larger K-01 has come and gone, and the Q has gone through four models, the last two (Q7 and Q-S1) have had slightly larger sensors, apparently because when the original model was launched there were few compact sensors available with full HD video ability. The last three models were also less costly, but fans appreciate the higher build quality of the original. And those fans, along with the Tokyo Subway Commuters Club, have come to realize the little gem is a lot more capable than originally envisioned. For instance, like the Micro 4/3 mirrorless universe, there has grown a cottage industry of lens adapters for the Q system. Not only can DSLR Pentax lenses be fitted (even Pentax has their own adapter for that), but you can fit just about any optic you desire, given the very, very short flange distance. Have a fancy for old cine lenses? There are adapters for that: C-mount or D-mount, take your pick. If you read my earlier post about lens envy, then you’ll know why I took the plunge when the chance came up to buy an original Q body for next to nothing. When it arrived, I once again was dazzled by how crazy small it is. It really is dainty, and it makes you want to love it. Of course, a spate of orders quickly followed for adapters: K mount, Nikon mount, and Cine-D. Then there’s the other accessories, cute little cases, caps… I digress. But given that the Q needs a decent regular lens, I agonized between the highly-regarded 8.5mm normal lens (dubbed the O1 Standard Prime, in Q-speak), and the more versatile, but less optically perfect kit 5-15mm kit zoom (the 02 Standard Zoom). There are low-fi “toy” lenses that don’t really help the Q’s cause, and a decent fish eye. Late comers have been the 06 telephoto zoom, and the very pricey 08 wide zoom. Uncharacteristically for me, I chose the 02 zoom as my proper Q lens for the time being. But the first gadgets to arrive were the K and F adapters, and so began the quest to exploit the Q’s main asset – which of course, is resolution. “But the Q just has a 12 megapixel sensor,” you say. And you’re right, but those 12 megapixels are stuffed into a very tiny 6.17×4.55mm space (I’ll try to avoid calling it 1/2.3″ because I find that antiquated measurement system misleading). A full-frame DSLR’s sensor is some 30 times larger in area than the Q’s, so if you were to extrapolate those 12MP over the full frame, you’d have a 350 megapixel sensor. But put your favourite DSLR lens in front of that little Q sensor and you see a major boost in magnification (a “crop factor” of 5.5x, if you want to know). So that 50mm normal is now a decent telephoto, and a 135mm is now equivalent to putting an 800mm monster on your full frame. The trick is to try and get enough quality out of your old lenses to make it worthwhile. The Q reminds me a bit of the Minox subminiatures I used to mess around with. Those were fun, but I never got super results from mine. Sure, others were able to make big prints, often by using exotic films developed in semi-exotic potions. But even holding the tiny light camera steady was a challenge. It’s hard to jiggle a big SLR with a heavy lens. Those challenges translate well onto the Q. To get it to work, especially with adapted glass, focus has to be spot on, and just because the built-in stabilizer (SR) works with just about anything, doesn’t mean you can really hand-hold that 135mm and get usable photos. Proper super tele work requires a good tripod, probably a magnifier hood over that rear lcd, and the wireless remote so you don’t jiggle anything. The little camera is buried in the middle of the rig. But the important thing is there are those out there getting very acceptable results from such unlikely outfits – and the point is that all that birdwatching, or stargazing horsepower comes at a fairly low cost, assuming you can borrow that already-owned telephoto from your DSLR outfit. You don’t have to spend $11,000 to get right in a woodpecker’s face. I have to say I took my best-yet moon shot with the Q attached to the 300mm telephoto and 2x converter from my Nikon outfit. And I may just go after some birds when up north on vacation. Trying my best with the D-mount adapter and a host of old 8mm cine lenses, I have to admit defeat. Several good-looking optics vignette badly on the Q – as old 8mm film still has a smaller format than this little thing. Other lenses cover the format, but sadly lack enough sharpness to be worth the fiddling. I haven’t tried C-mount lenses, but I don’t think I will. So (drum roll please), I have to conclude the most practical and fun lenses to use on the Q are Pentax’s own Q-intended optics. The 5-15mm zoom offers a nice wide angle, which is hard to find in just about any other adapted optic. It has a leaf shutter, a switchable neutral density filter (to keep apertures wide near f4.0 for best sharpness) and, of course, autofocus. I may have to indulge in a couple more, particularly the 8.5mm f1.9 prime. But another worthy distraction are the lenses from the old Auto 110. A customer traded me a boxed set of three, along with the original camera and winder for the display shelf. With an adapter and a press fit aperture to help reduce flare, they do have promise. Down side is all three, including the 18mm “wide angle” are all long lenses on the Q. So Pentax has found a way to stuff most of the gadgetry of a mid-level DSLR into a tiny, tiny package, along with most of the fun. But we can’t have it all. The tiny sensor, and tiny optics do fall short of the image quality we get from our bigger camera and lens outfits. Still, the sharpest Q images do rival what we were getting from the big digitals only a few years ago. The real fun, however, is the reaction of someone who watches you click the little lens off its little mount, and bayonet on another. “Wow,” is usually all they say. Welcome to Tokyo. Get your transit pass ready. You are currently browsing the Windsor Photo Outfitters...Exposed! weblog archives.